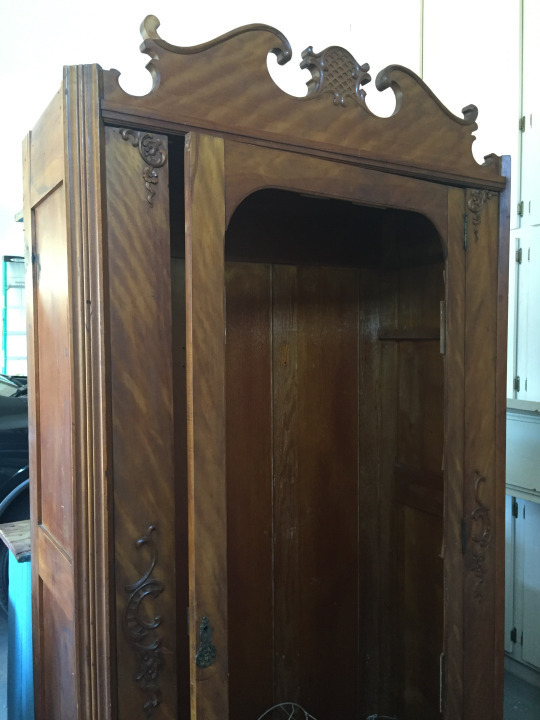 I stumbled upon this sad little armoire while doing my nightly search on Craigslist. Since the mirror was broken, the asking price was a mere $75. When I went to pick it up the next morning, the owner said she had purchased it years ago because she liked its lines, but just didn’t know what to do to make it functional again. She said she really wanted to know what my plans were for it. I made sure the armoire was safely tied down in the back of my trailer and Chris had the getaway car started before I gave her my simple idea. Adding shelves to this armoire seemed like a no-brainer to me. This particular piece was a perfect candidate! It has one door, and is small in size. I contemplated taking the door off completely, but couldn’t bear to part with the lovely curve on the top and bottom. 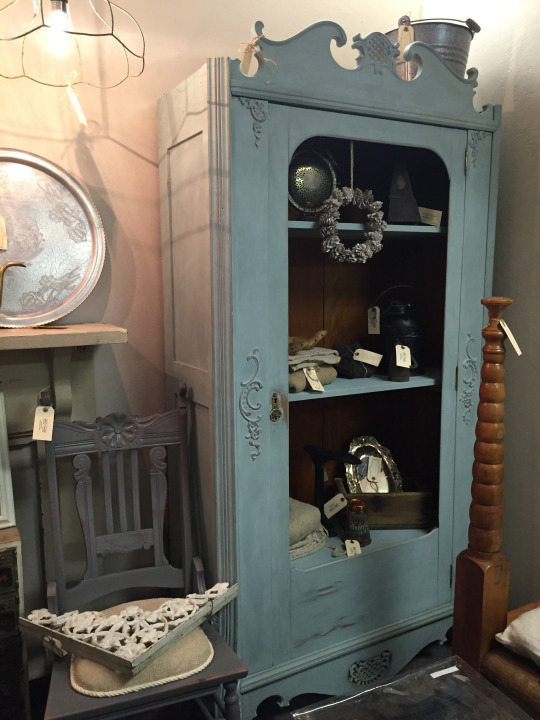 The wood wasn’t pretty enough to keep natural looking, and I felt like this armoire was begging to be dressed in a light grey blue. I was happy to oblige! 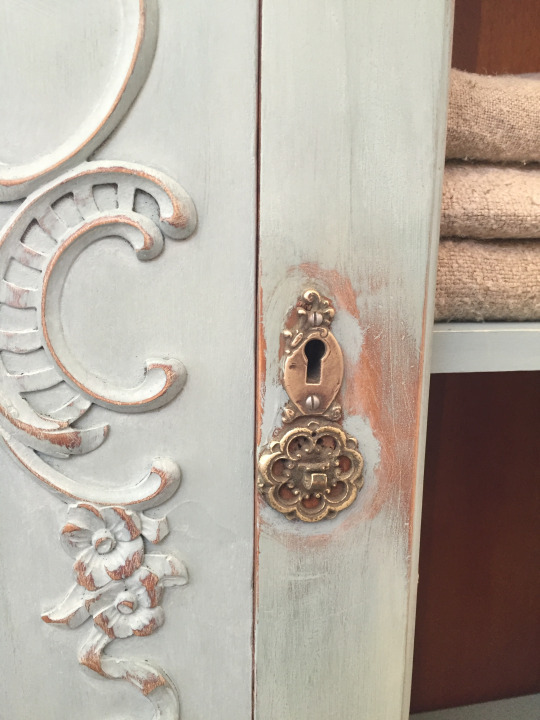 After painting with Annie Sloan chalk paint, I used a white wax to age the paint and give it the old, weathered look I was aiming for. I then sanded the parts that would naturally wear with age and use. To shine up the old brass hardware, I used a very fine steal wool and lightly rubbed until it sparkled once again. Adding shelves repurposed this broken armoire into a beautiful and functional cabinet. I can see it in a master bathroom with rolled towels and lovely baskets, or in an office adorned with leather-bound books and black and white family photos. This piece is now charming, functional and perfectly broken!